Work is not mounted directly on the table but on the parallel strips laid on the table in order to give clearance for the tool. Here the height of the parallel strips should be such as to give work clearance so that the tool will move past the lower edge of the work and have enough table clearance so that the tool will not strike the table when the ram is at the end of the cutting stroke. If the tool strikes the table, it will break and may result in other damage to the machine. The following procedure is to be adopted for cutting keyways in bush. (a) Scribe the centreline across the boss and mark the width of the key way. Set the job on the pair of parallel strips of about 1/2” height and clamp it. (b) Obtain a keyway cutting tool and clamp it in the tool holder. Adjust the stroke of the ram to suit the ram so that the tool just clears the table at bottom of the stroke. (c) Set the tool central to the marking out and commence to slot the keyway, feeding very gradually by hand. When nearing the depth, measure it with vernier callipers. (d) Finally finish the full depth of keyway. With suitable tools, a slotter can very conveniently machine slots or grooves on a work or cut external keyways on shaft. For cutting keyways, a square nose tool similar to a parting off tool is selected. External keyways are cut on a shaft by first drilling a hole at the blind end of the keyway. The diameter of the hole should be 0.5 to 0.8 mm oversize than the width of the keyway and the depth should be about 1.5 mm deeper than the depth of the keyway. This is necessary to leave a clearance on the tool at the end of the stroke. The length and position of stroke is carefully adjusted so that the stroke will terminate exactly at the clearance hole. The speed is reduced while cutting keyways. The following procedure is to be adopted for cutting Serrations. (a) The slotting machine with circular table provides a convenient means of cutting internal or true external Serrations. (b) Set the work on two parallel strips on the Circular table. (c) True the outside diameter using a dial test indicator held in the tool box. (d) Put two or three clamps round the outside and secure it tightly. (e) A V-tool would be used for cutting serrations and it would be fed to the same depth in each indexing. (f) The indexing of the circular table would have to be carried out to suit the number of slots being cut, the angle being found by dividing 3600 by the number of serrations to be cut on the periphery of the work. (g) Index to each position and finish slotting of serrations to the same depth. (a) QRM is obtained by using a slotted crank lever mechanism. (b) QRM by using Whitworth Quick Return Mechanism. The ram is actuated by connecting rod and adjustable crank driven by gearing or suitable pulleys. The pinion drives the bull gear. Across the face of the bull gear there is dovetail slide which carries the crank block on which sliding block is fitted. The sliding block slides in the slot of the link lever. A driving rod connected to a pin is fixed at the rear of the ram. The stroke of the ram is altered by the radial adjustment of the driving gear attached to the crank block. 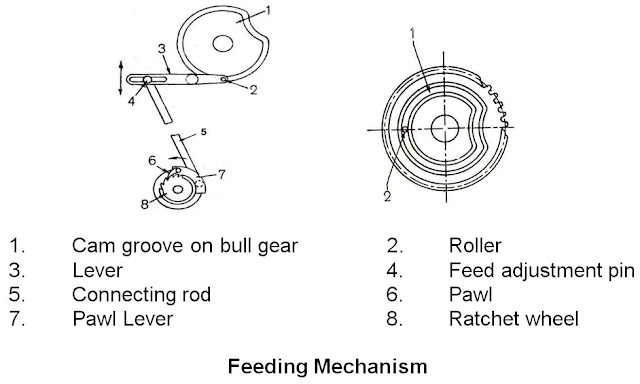 Feed Mechanism. In a slotter, the feed is given by the table. A slotting machine may have three types of feed movements. The feed movements may be supplied by either by hand or power. The hand feeding mechanism for the reverse, longitudinal and circular movement of the table consists of three screw rods operated by crank handle, which may be attached to the square end of the feed rods. The power feed mechanism makes use of a ratchet and pawl mechanism. A cam groove 1 is cut on the face of the bull gear in which a roller 2 slides. As the bull gear rotates, the roller attached to a lever 3 follows the contour of the cam groove and moves up and down only during a very small part of revolution of the bull gear. The cam groove may be so cut that the movement of the lever 3 will take place only at the beginning of cutting stroke. The rocking movement of the lever 3 is transmitted to the ratchet and pawl mechanism 6 and 8, so that the ratchet 8 will move in one direction only during this short period of time. The ratchet wheel is mounted on a feed shaft which may be engaged with cross, longitudinal or rotary feed screws individually or together to impart power feed movement to the table. The length of stroke of ram can be varied by altering the position of pin with respect to the centre of the disc. Farther the position of the pin with respect to the disc centre, greater will be the throw of eccentricity and longer will be the stroke length. The stroke is to be set in the following sequence. (a) Bring the ram to its bottom most position. (b) Set the length of stroke half inch more than the length of job by rotating the driving gear with hand and reading directly by the stroke indicator on the scale. (c) Unclamp the ram which is still in the bottom most position and adjust the position of tool so that the cutting point of the tool goes ¼” below the machine surface or clear in the slot or recess provided for tool clearance by bringing the ram down. (d) Clamp the ram and check the setting by moving the Ram up and down by hand wheel.